What is Fixd And Do You Need It? Fixd is a diagnostic tool that you can use even if you have absolutely no experience with diagnosing or fixing a vehicle. It consists of a small sensor that you plug into your car or truck, and an app that you install on your phone. The sensor and app work together to accomplish the same task as the expensive scan tools used by professional mechanics. While Fixd does have its limitations, and there are some vehicles that it doesn't work with, it is a useful tool for anyone who has ever wanted to know more about what's going on under the hood of their car. Fixd works by tapping into the onboard computer in your car, reading information that's stored there, and relaying the information to an app that you install on your smartphone. It's similar to generic ELM327 scan tools that perform the same basic task, except that the sensor is designed specifically to work with the Fixd app. If you want to get the most out of Fixd, you need to buy a Fixd sensor and install it in your vehicle. You can buy these sensors from retail stores like Walmart, and online stores like Amazon, or you can buy directly from the source by downloading the Fixd app or visiting their website. The Fixd sensor is a small, rectangular dongle that's designed to plug into the OBD-II connector that can be found in all cars built after 1996. The connector is typically located beneath, or behind, the dash on the driver's side of the vehicle. In some cases, the connector is hidden behind a removable panel or located in the center console. Since OBD-II connectors are capable of providing power, the Fixd sensor doesn't need a battery, and you don't need to worry about plugging it into the cigarette lighter socket. All you have to do is plug it into the OBD-II socket, which provides both a data connection to the onboard computer and a power source. The sensor is also wireless, so you don't have to worry about routing wires under your dash. After you connect the sensor to your phone once, it will automatically connect each time you launch the Fixd app within range of the sensor. The Fixd sensor provides a wireless interface with your vehicle's onboard computer, but an interface is useless without some software to interpret all that data. The Fixd app handles that, and it also has a few other useful features that don't require a connection to the sensor. The main draw of Fixd is that the sensor is capable of reading trouble codes from your car, and the app is capable of translating that complicated jargon into something that the average person can easily understand. When you launch the Fixd app, and connect it to a sensor, the default tab shows the condition of your vehicle. If the onboard computer has any trouble codes stored, they are displayed in this default tab. That puts some pretty powerful information at your fingertips. In addition to providing you with the number of each code, Fixd also tells you, in plain language, what the code means. It also provides you with the most likely symptoms associated with that code, like poor fuel economy or lack of power, and a rough idea of how much it might cost to get it fixed. 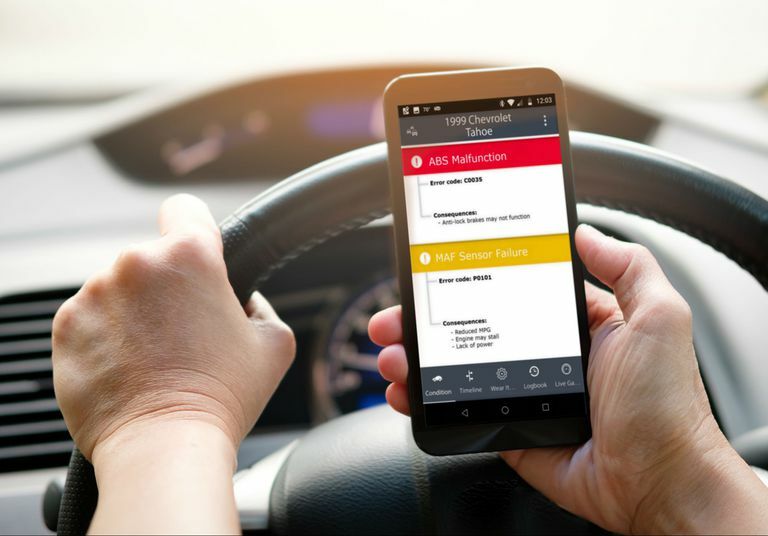 The app also provides you with a timeline tab for keeping track of regular maintenance, a wear items tab where you can keep tabs on your tires and wiper blades, a log book, and a live data tab you can use when you're driving. Will Fixd Work With Your Vehicle? Fixd works with most cars that are on the road today, but there are some exceptions. Since it relies on OBD-II, it only works with vehicles that were built after 1995. This isn't an exhaustive list of requirements, and there are also other exceptions. For example, Fixd doesn't work with electric vehicles, and there are some compatibility problems with older diesel vehicles. To see if your vehicle will work with Fixd, you can check out their compatibility tool. Fixd is a useful tool, but it can't diagnose everything. The general rule is that if a problem causes your "check engine" light to turn on, then Fixd can tell you why the light turned on and what type of repair you might need. Diagnosing a car is a whole lot more complicated than just reading trouble codes, and one code can be caused my multiple different problems. So even though Fixd can give you an idea of how to fix your problem, and even help you buy the replacement parts you need, complicated issues may still require the assistance of a professional mechanic.